The value of pet therapy is a proven concept, especially for those people confined to nursing homes, rehabilitation centers, and other long-term care facilities. Greyhounds are one of the best-suited dogs for this type of work. Their calm demeanor, friendliness, and short hair all contribute to their acceptance into this growing area of volunteerism. I have learned this firsthand as I now have two Greyhounds who are extremely active in this field and are in constant demand. I have been using my 5-year-old Greyhound, Rocky, as a therapy dog for three years and introduced my second Greyhound, Shannon, to this activity ten months ago shortly after I adopted her. The three of us do visits three times per week. Over the years, I have met a lot of very interesting people of all ages and heard a lot of stories about their dogs and their lives in the “good old days.” The patients give the hounds endless amounts of petting, hugs, and kisses. I have also learned a lot about the indomitable spirit of human beings. In my search to come up with new and inventive ways to present my Greyhounds, I have come up with a good way to jazz up our visits. 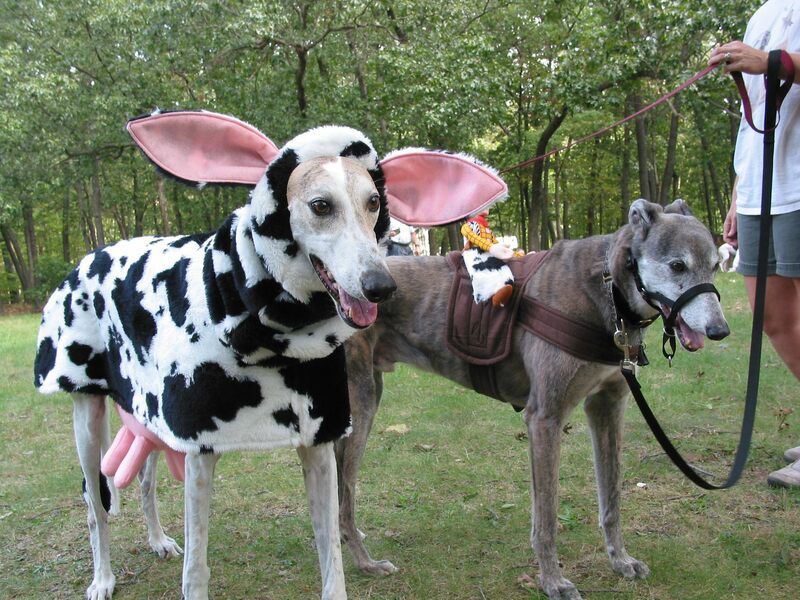 I have found that dressing up my Greyhounds for the major holidays keeps the spark in our visits. Valentine’s Day, St. Patrick’s Day, Easter, Halloween, and Christmas offer great opportunities to be inventive and to show off the Greyhounds and their affinity for dressing up. It’s a wonderful challenge to come up with something new and different for each holiday, much to the delight of the residents, as well as the staff personnel we meet. The residents try to guess just what my kids will come dressed up as on each holiday. Over the years, I have used reindeer and Santa Claus costumes for Christmas. A wonderful seamstress and artist in our club, Wendi Cowie, made them. The costumes don’t have to be anything elaborate or complicated. Sometimes the simplest costume is the most effective. For Valentine’s Day, I dress Rocky in valentine boxer shorts. For St. Patrick’s Day, he wears boxer shorts. Cardboard hats and decorations finish the outfits. For Easter, they have been reluctant bunnies; and this year, I am considering dressing them up as Easter eggs. For Halloween the choices are as endless as your imagination. Costumes for Rocky have consisted of cowboy, boxer, and jester. Shannon has been a June bug and ballerina. With a little bit of imagination and ingenuity, almost anything can become a costume. These costumes have been very inexpensive. Often you can find old costumes at thrift shops or use common household items to fashion your new creation. The looks of surprise and amazement on the staff and residents have proven to be well worth the time, effort, and expense I have invested. Smiles and howls of laughter abound when Rocky and Shannon show up dressed to the nines for each holiday. We really enjoy our visits. Visits to facilities do not have to be as frequent as ours; an occasional visit to a local nursing home, hospital, or rehabilitation center can be quite rewarding. The positive feedback you receive on these visits will leave you energized and you will never miss the little bit of time you invest. I guarantee the effects of your visit will linger long after you have left. The residents always eagerly await our scheduled visits; they talk about us for days afterwards. Sometimes, I hear that our visits are the only contact with the outside world for some of these people. What a wonderful way to share your love and joy with them and your Greyhounds! Why not get in touch with a facility near you and find out just how easy it is to bring a little ray of sunshine into the life of others who are not as fortunate as you? Sharing your Greyhounds with those who cannot own a dog is truly one of the most rewarding experiences you will ever have. Please consider pet therapy for you and your incredible Greyhounds. Therapy Dogs, Inc. http://www.tdi-dog.org. Phone: (973) 252-9800. Delta Society. http://www.petsforum.com/DELTASOCIETY. Phone: (425) 687-2345.